Next ReviewAnimal Behavior Desk Reference, a dictionary of animal behavior, ecology and evolution by Barrows Edward M.
SUMMARY: In-depth analysis of some common issues surrounding companion animal behaviour, including legal and welfare issues. 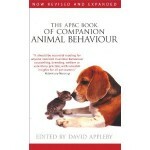 It focuses mainly on dogs, but has some chapters on cats/rabbits. AUDIENCE: Not quite for the academic, not quite for the layman: this one falls neatly into the professional category. Read it if you want to strengthen your knowledge on common behaviour problems, and on issues affecting the professional animal behaviour therapist. REVIEW: Overall, the book was a real pleasure to read. It showed the right mix of everyday English and scientific rigour in most places. I finished the book in two days, that’s how much of a smooth read it is. One chapter –The importance of Positive Reinforcement– felt like the odd one out. It was written more in “Marketingese” than in textbook English. The rest got the tone just right: professional and scientific, without being discouragingly dry. Look hard and you’ll find the odd internal inconsistency. So it could do with a little dusting up in the next revision process, to eliminate the last few (minor) inter-chapter contradictory claims. They covered the “dominance” topic, always a tough one, with balance, subtlety and tact. It did occasionally feel like the author had been censored into replacing sensitive, but descriptive, words, with a more politically acceptable version. I found the chapter on old age-related behaviour issues and socialisation nothing short of revelatory. Prior to reading the book, I thought I grasped these subjects, but it gave me a whole new perspective. The title suggests an exhaustive review of all common behaviour problems in all companion animals, but it is of course limited to a sample of behaviour problems, and mainly in dogs. This happens to suit me just fine (I value depth over breadth), but the title is a little vague. The authors’ background section reads like a who’s who in companion animal behaviourism. It is, quite simply put, awe-inspiring. It has given me the ambition to join their esteemed ranks and try for a CCAB (Certified Clinical Animal Behaviourist). Yet another dream to fulfill, thank you, Mr. Appleby! In short: I would read this book if you’d like the view of the world’s most esteemed professionals on specific issues of clinical companion animal behaviour. Browse the Book Review archive. Genre: dictionary. Author: Barrows Edward M.. Reading Level: Academic. Star: 4. Bookmark the permalink. Post a comment or leave a trackback: Trackback URL.